As part of an ongoing response to the challenges enabled by in-app purchases, Apple has added a new section to the App Store explaining the ins and outs of app purchases. The new section  titled "Learn More About In-App Purchases"  gives brief explanations on four topics: What Are In-App Purchases; Types of In-App Purchases; How In-App Purchases Work; and Parental Controls. The last section has links to Apple's Understanding Restrictions page and Parents' Guide. The move is a part of Apple's ongoing efforts to deflect criticism over what some call a faulty in-app purchase system. Apple has come under fire lately after a number of children were able to run up sizable bills on their parents' charge accounts thanks to in-app purchases in so-called "freemium" games. 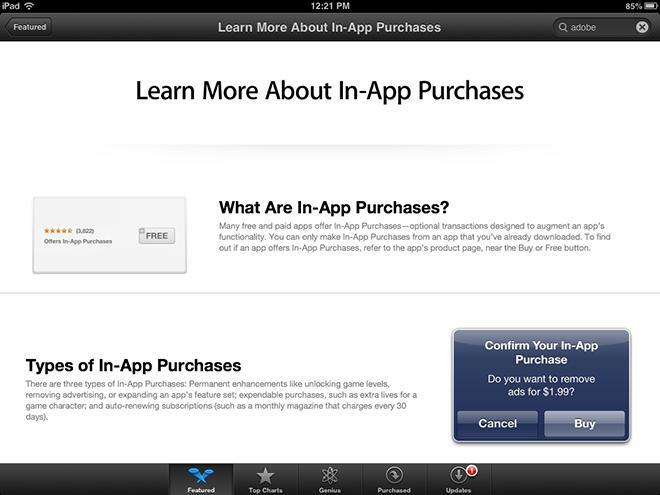 Apple has since kicked off a campaign to increase awareness of the potential pitfalls of in-app purchases. The company first rolled out warnings on in-app purchases in the OS X version of iTunes last month. An update to the iOS App Store followed shortly thereafter. Those updates place warnings beneath the app ratings that the app "Offers In-App Purchases."